Harnessing the power of Intel’s Xeon X3470 processor and an overwhelming 8GB of cutting-edge DDR3 RAM, the N12000 can handle anything and everything at full speed. There are no bottlenecks or speed bumps. With a whopping 48 terabytes of data capacity, you’ll never go wanting again. No matter whether you are providing a public server for a massive workforce or compiling a company’s worth of HD video, your NAS will always be hungry for more. The N12000 features support for internal hard drives with SATA III and SAS 6G. This top-of-the-line connection transfers at speeds up to an amazing 6Gbit/s. It is also backwards-compatible with SATA II, so your old disks can be swapped in and out without a hitch. 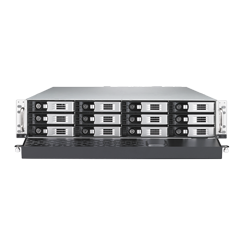 The N12000 safeguards your data with all the RAID modes you could possibly need for an Enterprise server, including RAID 0, 1, 5, 6, 10, 50, 60, and JBOD. Changing damaged hard disks is also a breeze with its built-in hot-swap, hot-spare, online RAID migration and expansion, as well as auto-rebuild capabilities. And if you need even more protection, there is also AES 256bit RAID volume encryption available.  Take the speed of iSCSI up a notch with block level access transfers. While most transfer protocols send huge files all in one piece, this function breaks down files in smaller chunks, increasing transfer speeds immensely. With a firm foothold in the Enterprise NAS market, Thecus knew it was necessary to provide a NAS for every budget and every need, big or small. 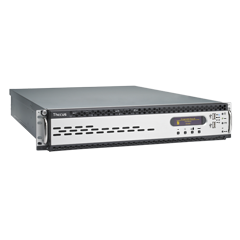 Thecus's track record of NAS from 2-bay up to 7-bay speaks for itself, with great reviews from sites such as Tom's Hardware, iXBT, SmallNetBuilder, and many more across the globe. 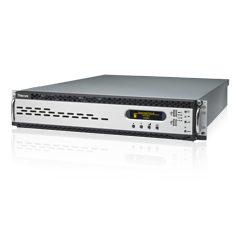 With the release of the N16000 NAS for large enterprise and massive data storage needs, we quickly realized that there was a gap that needed to be filled, and the N12000 does just that. Many leading businesses are making the switch from bulky, overpriced servers to comprehensive NAS solutions. These are innovative start-ups, established worldwide firms, and everything in between. No matter where your business is or where your plan is headed, there is a NAS solution from Thecus that fits your specific needs. 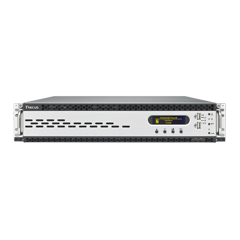 The 12-bay N12000 is perfect for businesses making that leap from medium to large, domestic to international, and behind-the-scenes to household name. When you need speed, security, and data storage to satisfy your company now and when it doubles in size, the N12000 is your answer. 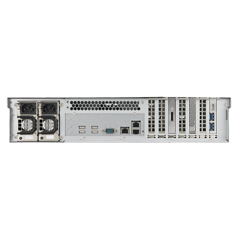 The N12000 features some of the most overwhelming hardware in the computing world. The Intel® Xeon® X3470 Quad-Core processor clocked at 2.93GHz is more than enough to quickly build massive RAID partitions, support hundreds of users, and blaze through massive data transfers at record speeds. To utilize this advanced hardware to its full extent, we've implemented a 64-bit operating system to make sure you get all the power that this machine is capable of. It also supports the next generation of hard drives with 6G SATA/SAS technology, so the fastest disks will always be at your disposal. All of this performance is for dealing with up to 48 Terabytes of data capacity across 12 disks, more than enough for the demands of even the largest businesses.  As an enterprise-class NAS, the N12000 needs to be on line and accessible at all times. High Availability (HA) is the most sophisticated system for keeping your data safe and within reach at all times. By running two parallel NAS, HA allows constant synchronization between the two. RAID can protect you from losing data, but HA protects you from even a momentary loss of access. The value of HA really becomes apparent when disaster strikes and one NAS experiences a problem; all traffic is channeled to the second NAS with no break in service or data loss whatsoever.From there it is a simple matter of hot-swapping out the damaged disks and letting your Thecus NAS automatically rebuild its RAID partitions; before you know it, you're back under the protective wing of HA. The N12000's cutting edge HA technology employs the best of both worlds to keep your business running smoothly, ingenuity and simplicity. This NAS fits the bill perfectly for companies taking that next big step.